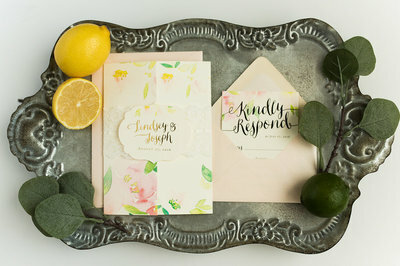 Choosing the color palette for your wedding, in my opinion, is one of the most important decisions you will make, aside from your vows and your dress. 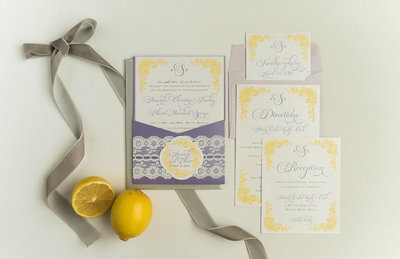 Everything,absolutely everything, will flow from your color selection. 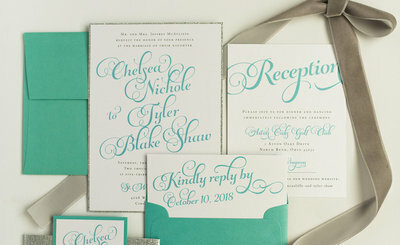 Choosing a timeless and limited color scheme will bring the elegance to the next level. 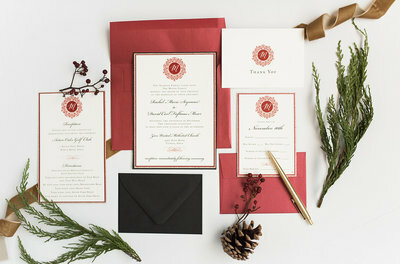 Personally, I think a limited color palette, 2-3 colors, with 1-2 of these being the main colors, and the second or third being the “pop” of color used sparingly. 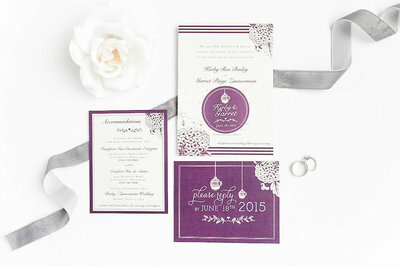 The same precedence goes with your wedding invitation design. For Maria and Jason, they made all the right choices. 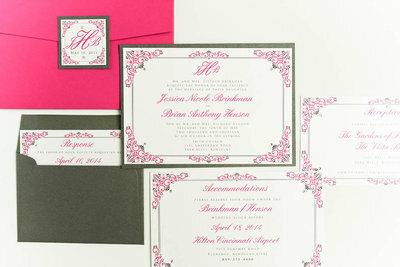 Their wedding colors were a timeless black and white, with silver as their accent color. 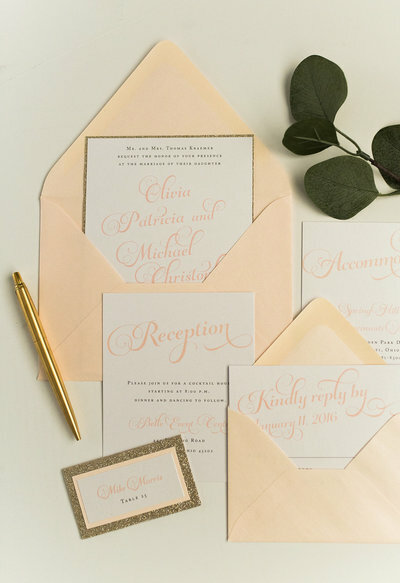 Their wedding day was formal and elegant, and wanted their invitations to be the first glimpse of elegance their guests would see. 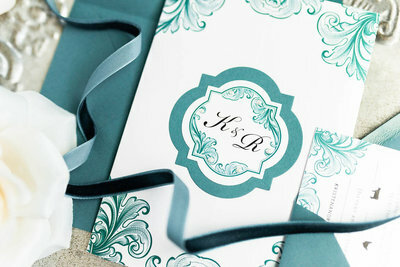 With their gorgeous color palette doing most of the eye-appeal, Maria and Jason chose a minimal design. 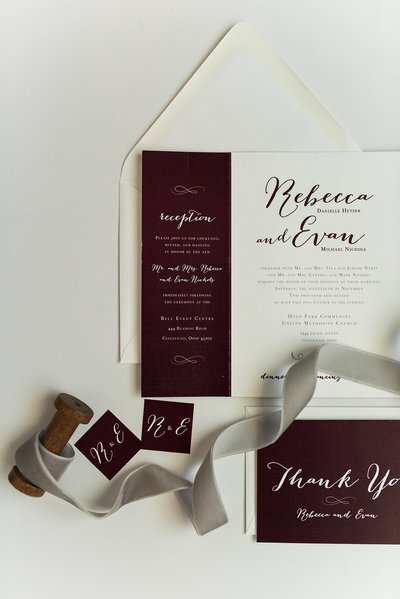 Their script names were the focal point of the invites, printed on classic signature white matte paper, with a black backer that enhanced the black on white text. 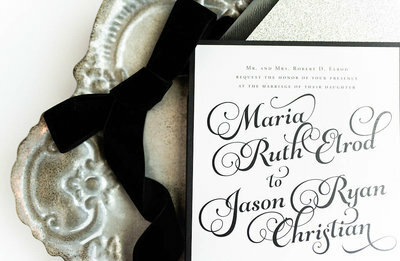 The script font was carried throughout the enclosure cards, and the suite itself, wrapped in a silver glitter belly band, with a black on white monogram tag and black tag backer to match the invitation. 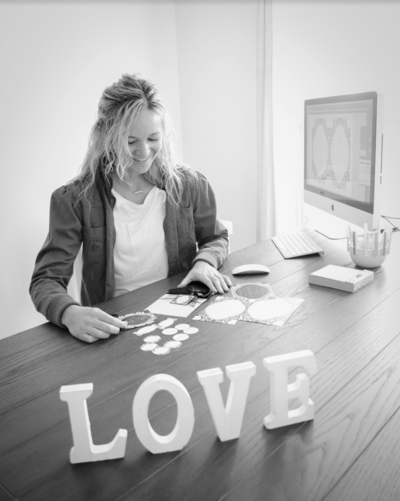 If you are currently considering a black and white wedding, my advice would always be yes!